Welcome to the roller coaster world of the adrenalin cowboy as they take on the nation’s most extreme bucking bulls in a three-hour action packed event that will keep you on the edge of your seat from the first bull of the night through to the last. This is the final and deciding chapter of the PBR year-long race for National Titles. It’s a showdown like no other – 22 riders all eager for glory as they strive to overcome the power of the most extreme bucking bulls in a head to head battle of power, agility and the fight of the fittest eight seconds at a time over the course of two nights of competition. Choreographed with pyrotechnics, lasers, concert sound system and mega screen replays, with multiple camera angles that will take you behind the scenes and inside the bucking chutes as riders prepare for the ride of their life whilst delivering you the ultimate live event bull riding experience inside the Townsville Entertainment and Convention Centre. 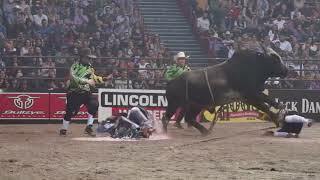 This is the one and only PBR National Finals.